Citrus County Burglar Alarm Company, Affordable Security Alarm Monitoring in Inverness Florida. 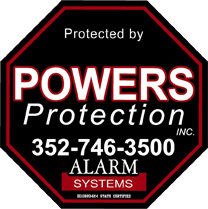 - Powers Protection Alarm Systems Inc.
With our company you can choose to be monitored or non-monitored. Monitored systems are those where a private company monitors your system 24 hours a day and 7 days a week, alerting the police if something goes wrong and you cannot be contacted. Unmonitored systems have on-site sirens and flashing lights that alert your neighbors of a break in, meaning that you will be relying on them to contact the police in you are not home. The best security comes from monitored systems, because of the consistency and watchfulness. 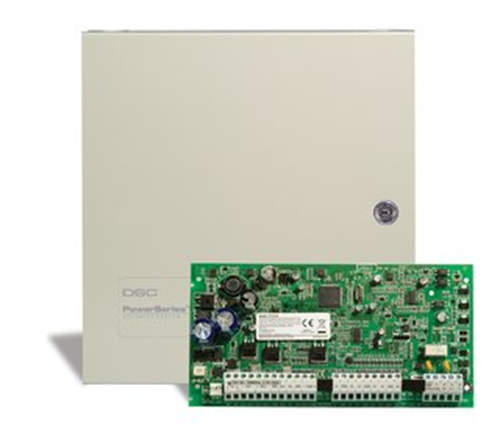 The heart of your basic DSC security system is the control panel. This resides in a locked metal cabinet generally located in a closet of your home. The panel connects all of the devices to the main user interface points such as a keypad or wireless key. It also communicates alarm events to the Central Monitoring Station. The keypad helps you keep connected with your system. The keypad in your home allows you to arm and disarm your system. Also, when a battery is low in one of your sensors, a door or window is open, or even if the time and date is not set right the keypad will notify you. Along with the Keypad there is other equipment that goes along with your DSC Powerseries Control Panel that includes wireless alarm communicator (connects the alarm control panel t the GSM network and reports alarm signals directly to a monitoring station receiver), door/window sensors (the sensors monitors the perimeter of the building and van be used to sound a chime when someone enters or leaves), smoke detectors (detects both smoke and heat, alerts the central monitoring station about the nature of the alarm), and a added convenience we have are wireless keychain remote (allows you to arm and disarm your system, or call for help with a press of a button. Along with the monitors, we provide Alarm.com interactive phone app which allows you to view your cameras in your home or business. 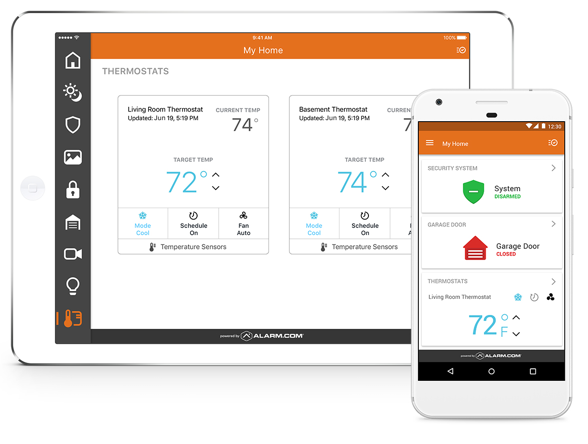 Alarm.com’s mobile app puts your home’s security, access and comfort at your fingertips. With this app you can see what’s happening at your property, arm or disarm your security panel, watch live video and recorded clips from your security cameras, turn on or off lights, set the ideal temperature, lock or unlock, doors, view images of important activity captured by Alarm.com image sensors, along with so many other benefits from alarm.com. 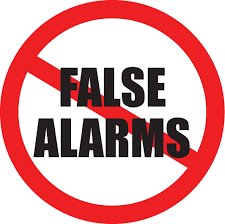 False alarms cost municipalities a lot of money and could prevent emergency response personnel from responding to what is a genuine emergency. Most jurisdictions have ordinances that incorporate False Alarm Fees. Below are some guidelines to help prevent false alarms. Keep the Central Station telephone number in an easy to find location: 1-800-554-1104 (password required). Central Station operators will NOT call to verify Police or Holdup Panics BEFORE dispatching authorities, so you must call them if a Panic Button is accidentally activated. Central Station operators will NOT call to verify Commercial Fire Alarms BEFORE dispatching authorities, so you must call them if you know that the alarm was maliciously or accidentally activated. The phone line at the protected premises might be busy (your alarm calls out for each signal it generates), so you should always call Central Station to cancel false alarms, as they may try calling while your alarm has access of the telephone line. If the phone line at the protected premises is forwarded, you should always call Central Station to cancel false alarms, as they may try calling while your phone line is forwarded. Ensure each person with access to the premises has a unique keypad code, understands: how to Disarm/Arm the Alarm System, which doors are assigned to have an Entry/Exit Delay, the difference between the Armed “Stay” and Armed “Away” modes, how to cancel a dispatch for false alarms so as not to waste emergency response resources and to avoid potential fines. Ensure each person with access to the premises has a unique verbal password used as Central Station identification for: canceling a dispatch for false alarms, placing a specific zone(s) or the entire system on test, or conducting fire drills. Person with access to a panic button (Silent Hold-Up, Medical Panic, etc. ), understand how it works, and how to cancel dispatch if accidentally activated. Motion Detectors, Smoke Detectors, Carbon Monoxide Detectors, & Gas Detectors should be protected from dust (especially during remodeling and renovation projects). Clean regularly using a vacuum cleaner with a soft brush attachment, do not use furniture polish. The following should be kept away from armed Motion Detectors: helium-filled balloons, hanging decorations/signs, fans, heat producing equipment (portable heaters, etc. ), large plants, open windows/doors, pets (even motion detectors incorporating pet immune technology have limitations besides pet weight). Certain building defects (loose fitting doors or windows, roof leaks, rodents chewing wires, etc.) can cause false alarms. For fence detection systems: Keep anything affected by wind (vines, weeds, shrub/tree branches, banners/signs, etc.) free from fencing. Replace missing UV rated wire-ties. Keep fencing posts and fasteners maintained. Keep fencing material taut. On a regularly basis, visually inspect and test perimeter contacts (doors & windows) by opening & closing each with the Chime Mode on, confirming a chime occurs for each.